Database systems are more and more employed to analyze an ever increasing amount of temporal data by applying a continuously evolving knowledge and are expected to do this in a timely fashion. Examples are financial services, computer systems monitoring, air traffic monitoring, and patient care. In each of these cases data are processed in order to understand current situations and to determine optimal responses. 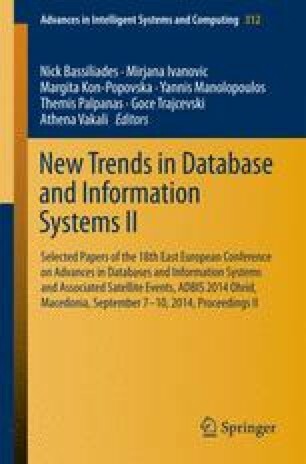 In this paper, we exemplarily investigate system requirements for a patient care scenario in which patient data are continuously collected and processed by a database system. We show that the concepts provided by today’s systems are still not enough for supporting the complex reasoning process needed. In particular, we identify situation-based reasoning as a missing database component and propose a temporal state concept for leveraging simple event processing. States provide a high level (and qualitative) description of past and current situations defined over streams of medical data, complemented by projections into the future. Our proposed database extension allows for a compact and intuitive representation of medical data; much like physicians use abstraction from details and dramatically simplifies the analysis of medical data.